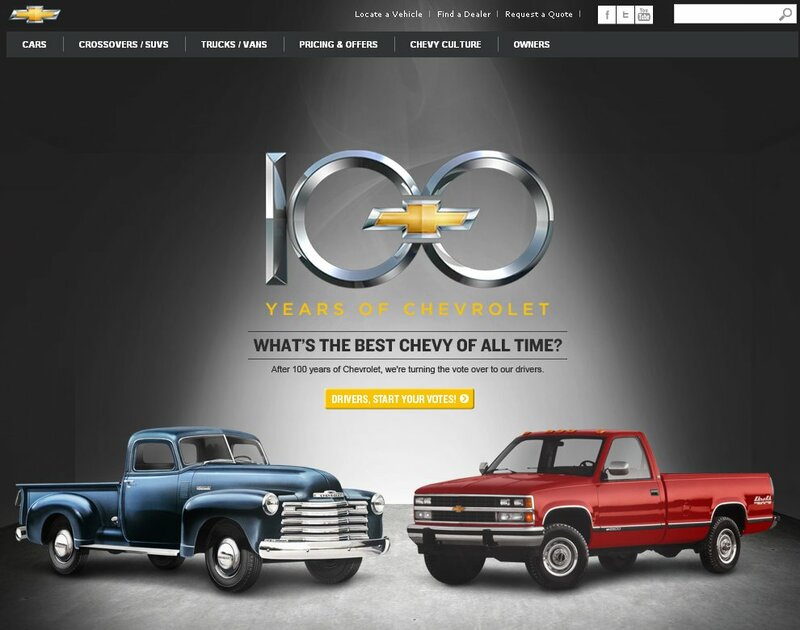 Congratulations to Chevrolet as they get ready to celebrate their 100th birthday on November 3. As part of many festivities that are to happen until then, the brand developed an online experience that pits its 100 years of select models against each other. 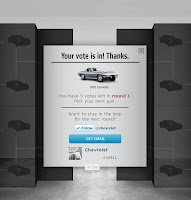 It is basically a bracket challenge where people vote for their favorite Chevrolet cars and trucks. 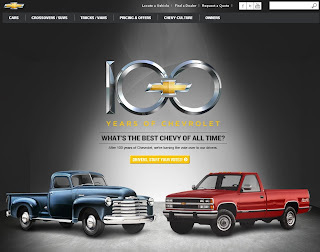 The 100 Years of Chevrolet website combines several social media connections with the brand where people vote by clicking a Facebook like button all to answer the age old question "What's the best Chevy of all time?" I know I wasn't asking that question either, but it is fun choosing which car or truck you like best in each round. Most votes have a clear winner in the first round, but the 1970 Chevelle SS convertible and the 2010 Camaro are in a pretty close match with only 100 votes separating the two cars after almost 4,000 total votes in the match. 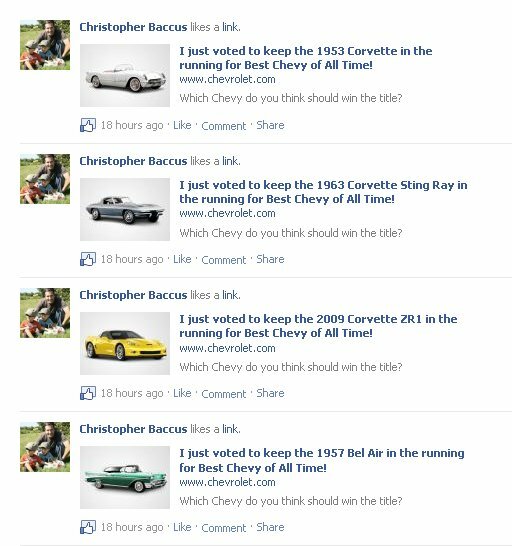 Psst...I voted for the Chevelle SS. 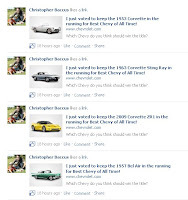 Other than the minor publishing to Facebook situation, and yes I get why they did it that way as it creates interest to my friends on Facebook and hopefully more traffic for Chevy's website, the experience is solid and focuses more on people's love of the current lineup and their love of Chevy's prolific automotive history. 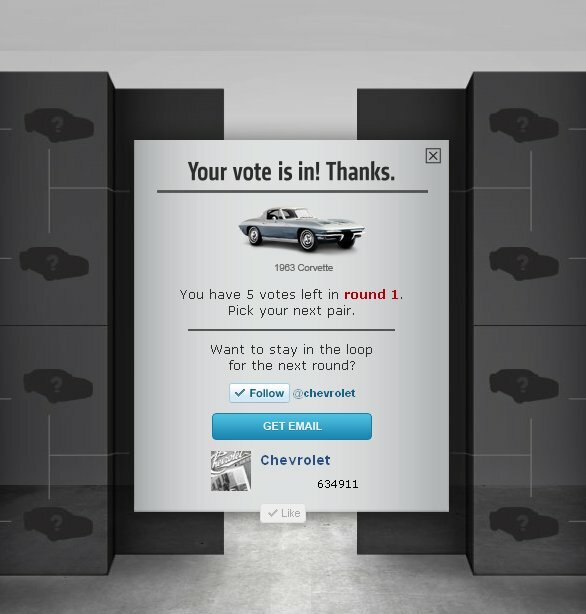 So go and vote for your favorite Chevrolet vehicles! It would be much better if i could fill the whole thing out, instead of getting tons of individual Facebook post. Other than that it's pretty sweet. why doesn't anyone make the comment that Chevy technically is not 100 years old. It failed with GM.... they are all 2 years old now. Remember how GM screwed everyone? How quickly you forget... All brands are now new with new names... but call it what you will.